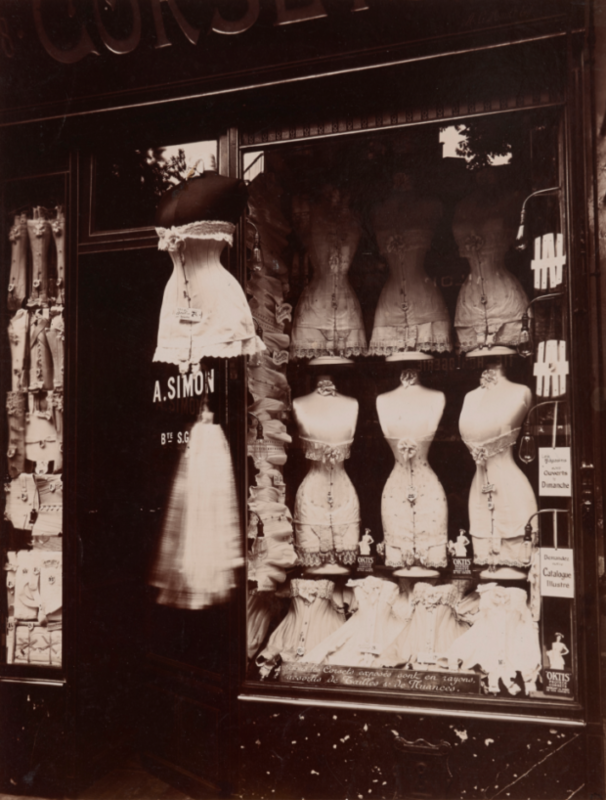 Eugene Atget (French, 1857–1927), Boulevard de Strasbourg, Corsets, 1912. Eugene Atget (French, 1857–1927), Rue Asselin, 1921. 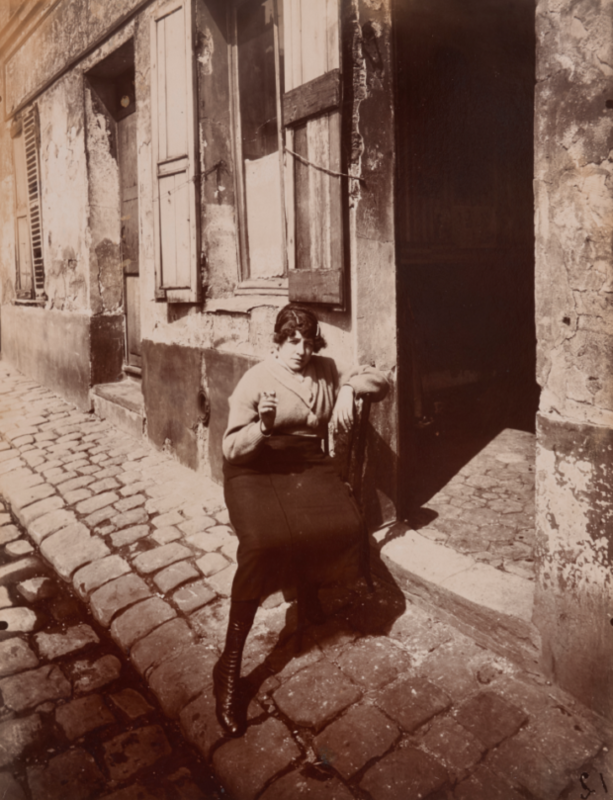 At a time when most photographers embraced the romantic tropes of photography, the luminous, ethereal mists that lent a painterly air to the scene, Eugène Atget (1857–1927) was decidedly modernist. He took to the streets and systematically documented the vernacular truths of his native Paris. Faithfully recording the architecture, shop fronts, parks, and sculptural embellishments, he produced a body of work he regularly sold to artists, architects, stage designers, and libraries. His studio was just a few doors down from that of Man Ray, who had brought on an assistant, the American photographer Berenice Abbott (1898–1991), in 1923. And indeed, she did — making a name for herself as New York’s foremost architecture and urban design photographer during the 1930s. 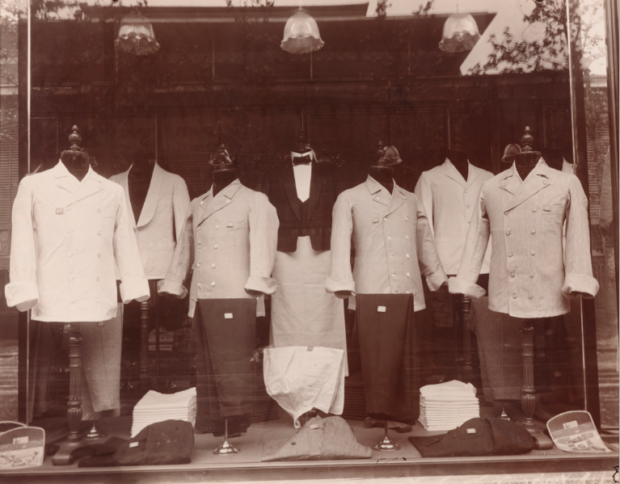 Now, author Kevin Moore explores the dynamic that fueled Abbott’s vision in Old Paris and Changing New York: Photographs by Eugène Atget and Berenice Abbott (Yale University Press), and the accompanying exhibition recently on view Taft Museum of Art in Cincinnati, Ohio. As a child of the American century, Abbott had a natural ambition that Atget lacked, and she began promoting her acquisition in the press, with the promise of a coming book and exhibition, which she had not actually secured yet. Her vision impressed no less than Janet Flanner, who penned the “Paris Letter” for The New Yorker, and introduced him to the general public in 1929 — and Abbott joyously went along for the ride. Atget, photographe de Paris (Atget, photographer of Paris), Atget’s first monograph, was published in 1930 in conjunction with his first U.S. exhibition, which included both Atget’s vintage and Abbott’s new prints. At a time when few photographers were publishing monographs, the book was remarkable for featuring 96 plates, including Abbott’s portrait of Atget on the title page. At the same time, Abbott was in the planning stages for what would become her magnum opus on New York. The project took off in 1935, when Abbott received funding from the Federal Art Project, a division of the WPA. “It is odd to think of Abbott’s New York project as part of the FAP, a sister to the FSA, or Farm Security Administration, which sent Lange and others to rural America to photograph migrant farmers,” Moore writes. Instead, Abbott opted to photograph the landscape, such as it was: the streets, buildings, and bridges that make up the very fabric of New York. “I may feel that the skyscrapers are beautiful and majestic. Or I may feel that they are ugly, inhuman, illogical, ridiculous, pathological growths which have no place in the planned city,” she wrote in Abbott’s guide to Better Photography (1941). In essence, Abbott understood the visual rhythms of New York and the ways in which the vertical and horizontal spheres of life constantly intersect. She recognized the city in revolution a decade before the post-War boom took hold, and by 1937, unveiled Changing New York at the Museum of the City of New York — and photography would never be the same again. 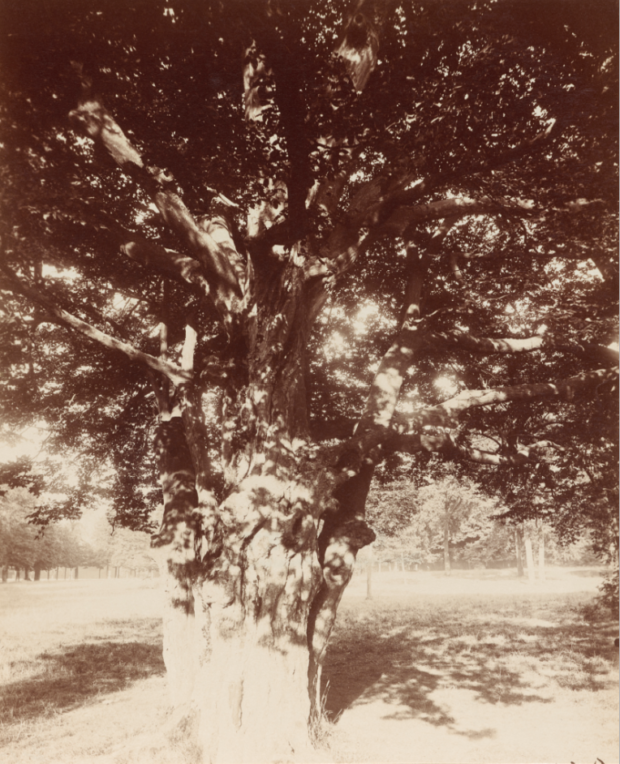 Eugene Atget (French, 1857–1927), Parc de St. Cloud, 1919-1921. Albumen silver print. Eugene Atget (French, 1857–1927), Shop, Les Halles, 1925. 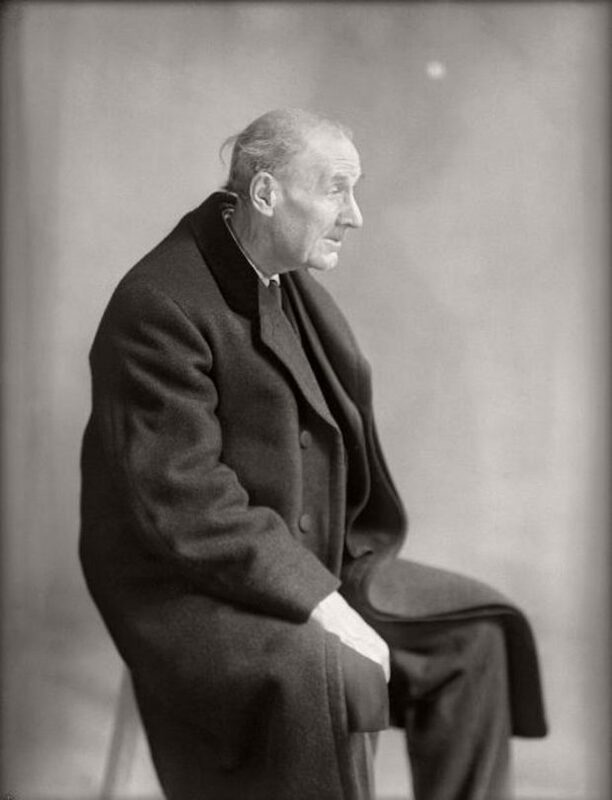 Berenice Abbott (American, 1898-1991), Eugene Atget, 1927.